Proceedings of the Royal Society of Edinburgh , Vol. VI, 1867, pp. 94-105. Reprinted in Phil. Mag. Vol. XXXIV, 1867, pp. 15-24. After noticing Helmholtz’s admirable discovery of the law of vortex motion in a perfect liquid—that is, in a fluid perfectly destitute of viscosity (or fluid friction)—the author said that this discovery inevitably suggests the idea that Helmholtz’s rings are the only true atoms. For the only pretext seeming to justify the monstrous assumption of infinitely strong and infinitely rigid pieces of matter, the existence of which is asserted as a probable hypothesis by some of the greatest modern chemists in thei rashly-worded introductory statements, is that urged by Lucretius and adopted by Newton—that it seems necessary to account for the unalterable distinguishing qualities of different kinds of matter. But Helmholtz has provided an absolutely unalterable quality in the motion of any portion of a perfect liquid in which the peculiar motion which he calls “Wirbelbewegung” has been once created. Thus any portion of a perfect liquid which has “Wirbelbewegung” has one recommendation of Lucretius’s atoms—infinitely perennial specific quality. To generate or to destroy “Wirbelbewegung” in a perfect fluid can only be an act of creative power. Lucretius’s atom does not explain any of the properties of matter without attributing them to the atom itself. Thus the “clash of atoms,” as it has been well called, has been invoked by his modern followers to account for the elasticity of gases. Every other property of matter has similarly required an assumption of specific forces pertaining to the atom. It is easy (and as improbable—not more so) to assume whatever specific forces may be required in any portion of matter which possesses the “Wirbelbewegung,” as in a solid indivisible piece of matter; and hence the Lucretius atom has no prima facie advantage over the Helmholtz atom. A magnificent display of smoke-rings, which he recently had the pleasure of witnessing in Professor Tait’s lecture-room, diminished by one the number of assumptions required to explain the properties of matter on the hypothesis that all bodies are composed of vortex atoms in a perfect homogeneous liquid. Two smoke-rings were frequently seen to bound obliquely from one another, shaking violently fromthe effects of the shock. The result was very similar to that observable in to large india-rubber rings striking one another in the air. The elasticity of each smoke-ring seemed no further from perfection than might be expected in a solid india-rubber ring of the same shape, from what we know of the viscosity of india-rubber. Of course this kinetic elasticity of form is perfect elasticity for vortex rings in a perfect liquid. It is at least as good a beginning as the “clash of atoms” account for the elasticity of gases. Probably the beautiful investigations of D. Bernoulli, Herapath, Joule, Krönig, Clausius, and Maxwell, on the various thermodynamic properties of gases, may have all the positive assumptions they have been obliged to make, as to mutual forces between two atoms and kinetic energy acquired by individual atoms or molecules, satisfied by vortex rings, without requiring any other property in the matter whose motion composes them than inertia and incompressible occupation of space. A full mathematical investigation of the mutual action between two vortex rings of any given magnitudes and velocities passing one another in any two lines, so directed that they never come nearer one another than a large multiple of the diameter of either, is a perfectly solvable mathematical problem; and the novelty of the circumstances contemplated presents difficulties of an exciting character. Its solution will become the foundation of the proposed new kinetic theory of gases. The possibility of founding a theory of elastic solids and liquids on the dynamics of more closely-packed vortex atoms may be reasonably anticipated. It may be remarked in connexion with this anticipation, that the mere title of Rankine’s paper on “Molecular Vortices,” communicated to the Royal Society of Edinburgh in 1849 and 1850, was a most suggestive step in physical theory. Diagrams and wire models were shown to the Society to illustrate knotted or knitted vortex atoms, the endless variety of which is infinitely more than sufficient to explain the varieties and allotropies of known simple bodies and their mutual affinities. It is to be remarked that two ring atoms linked together or one knotted in any manner with its ends meeting, constitute a system which, however it may be altered in shape, can never deviate from its own peculiarity of multiple continuity, it being impossible for the matter in any line of vortex motion to go through the line of any other matter in such motion or any other part of its own line. In fact, a closed line of vortex core is literally indivisible by any action resulting from vortex motion. The author called attention to a very important property of the vortex atom, with reference to the now celebrated spectrum-analysis practically established by the discoveries and labours of Kirchhoff and Bunsen. The dynamical theory of this subject, which Professor Stokes had taught to the author of the present paper before September 1852, and which he has taught in his lectures in the University of Glasgow from that time forward, required that the ultimate constitution of simple bodies should have one or more fundamental periods of vibration, as has a stringed instrument of one or more strings, or an elastic solid consisting of one or more tuning-forks rigidly connected. To assume such a property in the Lucretius atom, is at once to give it that very flexibility and elasticity for the explanation of which, as exhibited in aggregate bodies, the atomic constitution was originally assumed. If, the, the hypothesis of atoms and vacuum imagined by Lucretius and his followers to be necessary to account for the flexibility and compressibility of tangible solids and fluids were really necessary, it would be necessary that the molecule of sodium, for instance, should be not an atom, but a group of atoms with void space between them. Such a molecule could not be strong and durable, and thus it loses the one recommendation which has given it the degree of acceptance it has had among philosophers; but as the experiments shown to the Society illustrate, the vortex atom has perfectly definite fundamental modes of vibration, depending solely on that motion the existence of which constitutes it. The discovery of these fundamental modes forms an intensely interesting problem of pure mathematics. Even for a simple Helmholtz ring, the analytical difficulties which it presents are of a very formidable character, but certainly far from insuperable in the present state of mathematical science. The author of the present communication had not attempted, hitherto, to work it out except for an infinitely long, straight, cylindrical vortex. Forthis case he was working out solutions corresponding to every possible description of infinitesimal vibration, and intended to include them in a mathematical paper which he hoped soon to be able to communicate to the Royal Society. One very simple result which he could now state is the following. Let such a vortex be given with its section differing from exact circular figure by an infinitesimal harmonic deviation of order i. This form will travel as waves round the axis of the cylinder in the same direction as the vortex rotation, with an angular velocity equal to (i-1)/i of the angular velocity of this rotation. Hence, as the number of crests in a whole circumference is equal to i, for an harmonic deviation of order i there are i-1 periods of vibration in the period of revolution of the vortex. For the case i=1 there is no vibration, and the solution expresses merely an infinitesimally displaced vortex with its circular form unchanged. The case i=2 corresponds to elliptic deformation of the circular section; and for it the period of vibration is, therefore, simply the period of revolution. These results are, of course, applicable to the Helmholtz ring when the diameter of the approximately circular section is small in comparison with the diameter of the ring, as it is in the smoke-rings exhibited to the Society. The lowest fundamental modes of the two kinds of transverse vibrations of a ring, such as the vibrations that were seen in the experiments, must be much graver than the elliptic vibration of the section. It is probable that the vibrations which constitute the incandescence of sodium-vapour are analogous to those which the smoke-rings had exhibited; and it is therefore probable that the period of each vortex rotation of the atoms of sodium-vapour is much less than 1/525 [ED. Print too small in copy to see clearly; check this value against original] of the millionth of the millionth of a second, this being approximately the period of vibration of the yellow sodium light. Further, inasmuch as this light consists of two sets of vibrations coexistent in slightly different periods, equal approximately to the time just stated, and of as nearly as can be perceived equal intensities, the sodium atom must have two fundamental modes of vibration, having those for their respective periods, and being about equally excitable by such forces as the atom experiences in the incandescent vapour. This last condition renders it probable that the two fundamental modes concerned are approximately similar (and not merely different orders of different series chancing to concur very nearly in their periods of vibration). In an approximately circular and uniform disk of elastic solid the fundamental modes of transverse vibration, with nodal division into quadrants, fulfil both the conditions. In an approximately circular and uniform ring of elastic solid these conditions are fulfilled for the flexural vibrations in its plane, and also in its transverse vibrations perpendicular to its own plane. But the circular vortex ring, if created with one part somewhat thicker than another, would not remain so, but would experience longitudinal vibrations round its own circumference, and could not possibly have two fundamental modes of vibration similar in character and approximately equal in period. The same assertion may, it is probable  , be practically extended to any atom consisting of a single vortex ring, however involved, as illustrated by those of the models shown to the Society which consisted of only a single wire knotted in various ways. It seems, therefore, probable that the sodium atom may not consist of a single vortex line; but it may very probably consist of two approximately equal vortex rings passing through one another like two links in a chain. It is, however, quite certain that a vapour consisting of such atoms, with proper volumes and angular velocities in the to rings of each atom, would act precisely as incandescent sodium-vapour acts—that is to say, would fulfil the “spectrum test” for sodium. The possible effect of change of temperature on the fundamental modes cannot be pronounced upon without mathematical investigation not hitherto executed; and therefore we cannot say that the dynamical explanation now suggested is mathematically demonstrated so far as to include the very approximate identity of the periods of the vibrating particles of the incandescent vapour with those of their corresponding fundamental modes at the lower temperature at which the vapour exhibits its remarkable absorbing-power for the sodium light. A very remarkable discovery made by Helmholtz regarding the simple vortex ring is that it always moves, relatively to the distant parts of the fluid, in a direction perpendicular to its plane, towards the side towards which the rotatory motion carries the inner parts of the ring. The determination of the velocity of this motion, even approximately, for rings of which the sectional radius is small in comparison with the radius of the circular axis, has presented mathematical difficulties which have not yet been over-come . In the smoke-rings which have been actually observed, it seems to be always something smaller than the velocity of the fluid along the straight axis through the centre of the ring; for the observer standing besides the line of motion of the ring sees, as its plane passes through the position of his eye, a convex  outline of an atmosphere of smoke in front of the ring. This convex outline indicates the bounding surface between the quantity of smoke which is carried forward with the ring in its motion and the surrounding air which yields to let it pass. It is not so easy to distinguish the corresponding convex outline behind the ring, because a confused trail of smoke is generally left in the rear. In a perfect fluid the bounding surface of the portion carried forward would necessarily be quite symmetrical on the anterior and posterior sides of the middle plane of the ring. The motion of the surrounding fluid must be precisely the same as it would be if the space within this surface were occupied by a smooth solid; but in reality the air within it is in a state of rapid motion, circulating round the circular axis of the ring with increasing velocity on the circuits nearer and nearer to the ring itself. The circumstances of the actual motion may be imagined thus:—Let a solid column of india-rubber, of circular section, with a diameter small in propotion to its length, be bent into a circle, and its two ends properly spliced together so that it may keep the circular shape when left to itself; let the aperture of the ring be closed by an infinitely thin film; let an impulsive pressure be applied all over this film, of intensity so distributed as to produce the definite motion of the fluid, specified as follows, and instantly thereafter let the film be all liquified. This motion is, in accordance with one of Helmholtz’s laws, to be along those curves which would be the lines of force, if, in place of the india-rubber circle, were substituted a ring electromagnet ; and the velocities at different points are to be in proportion to the intensities of the magnetic forces in the corresponding points of the magnetic field. The motion, as has long been known, will fulfil this definition, and will continue fulfilling it, if the initiating velocities at every point of the film perpendicular to its own plane be in proportion to the intensities of the magnetic force in the corresponding points of the magnetic field. Let now the ring be moved perpendicular to its own plane in the direction with the motion of the fluid through the middle of the ring, with a velocity very small in comparison with that of the fluid at the centre of the ring. A large approximately globular portion of the fluid will be carried forward with the ring. Let the velocity of the ring be increased; the volume of fluid carried forward will be diminished in every diameter, but most in the axial or fore-and-aft diameter, and its shape will thus become sensibly oblate. By increasing the velocity of the ring forward more and more, this oblateness will increase, until, instead of being wholly convex, it will be concave before and behind, round the two ends of the axis. If the forward velocity of the ring be increased until it is just equal to the velocity of the fluid through the centre of the ring, the axial section of the outline of the portion of the fluid carried forward will become a lemniscate. If the ring be carried still faster forward, the portion of it carried with the india-rubber ring will be itself annular; and, relatively to the ring, the motion of the fluid will be backwards through the centre. In all cases the figure of the portion of fluid carried forward and the lines of motion will be symmetrical, both relatively to the axis and relatively to the two sides of the equatorial plane. Any one of the states of motion thus described might of course be produced either in the order described, or by first giving a velocity to the ring and then setting the fluid in motion by aid of an instantaneous film, or by applying the two initiative actions simultaneously. The whole amount of the impulse required, or, as we may call it, the effective momentum of the motion, or simply the momentum of the motion, is the sum of the integral values of the impulses on the ring and on the film required to produce one or other of the two components of the whole motion. Now it is obvious that as the diameter of the ring is very small in comparison with the diameter of the circular axis, the impulse on the ring must be very small in comparison with the impulse on the film, unless the velocity given to the ring is much greater than that given to the central parts of the film. Hence, unless the velocity given to the ring is so very great as to reduce the volume of the fluid carried forward with it to something not incomparably greater than the volume of the solid ring itself, the momenta ofthe several configurations of motions we have been considering will exceed by but insensible quantities the momentum when the ring is fixed. The value of this momentum is easily found by a proper application of Green’s formulæ. Thus the actual momentum of the portion of fluid carried forward (being the same as that of a solid of the same density moving with the same velocity), together with an equivalent for the inertia of the fluid yielding to let it pass, is approximately the same in all these cases. and is equal to a Green’s integral expressing the whole initial impulse on the film. The equality of the effective momentum for the different velocities of the ring is easily verified without analysis for velocities not so great as to cause sensible deviations from spherical figure in the portion of the fluid carried forward. Thus in every case the length of the axis of the portion of the fluid carried forward is determined by finding the point in the axis of the ring at which the velocity is equal to the velocity of the ring. At great distances from the plane of the ring that velocity varies, as does the magnetic force of an infinitesimal magnet on a point in its axis, inversely as the cube of the distance from the centre. Hence the cube of the radius of the approximately globular portion carried forward is in simple inverse proportion to the velocity of the ring, and therefore its momentum is constant for different velocities of the ring. To this must be added, as was proved by Poisson, a quantity equal to half its own amount, as an equivalent for the inertia of the external fluid; and the sum is the whole effective momentum of the motion. Hence we see not only that the whole effective momentum is independent of the velocity of the ring, but that its amount is the same as the magnetic moment in the corresponding ring electromagnet. The same result is of course obtained by the Green’s integral referred to above. The synthetical method just explained is not confined to the case of a single circular ring specially referred to, but is equally applicable to a number of rings of any form, detached from one another, or linked through one another in any way, or to a single line knotted to any degree and quality of “multiple continuity,” and joined continuously so as to have no end. In every possible such case the motion of the fluid at every point, whether of the vortex core or of the fluid filling all space round it, is perfectly determined by Helmholtz’s formulæ when the shape of the core is given. And the synthetic investigation now explained proves that the effective momentum of the whole fluid motion agrees in magnitude and direction with the magnetic moment of the corresponding electromagnet. Hence, still considering for simplicity only an infinitely thin line of core, let this line be projected on each of three planes at right angles to one another. The areas of the plane circuit thus obtained (to be reckoned according to De Morgan’s rule when autotomic, as the will generally be) are the components of momentum perpendicular to these three planes. The verification of this result will be a good exercise on “multiple continuity.” The author is not yet sufficiently acquainted with Riemann’s remarkable researches on this branch of analytical geometry to know whether of not all the kinds of “multiple continuity” now suggested are included in his classification and nomenclature. That part ofthe synthetical investigation in which a thin solid wire ring is supposed to be moving in any direction through a fluid with the free vortex motion previously excited in it, requires the diameter of the wire at every point to be infinitely small in comparison with the radius of curvature of its axis and with the distance of the nearest of any other part of the circuit from that point of the wire. But when the effective moment of the whole fluid motion has been found for a vortex with infinitely thing core, we may suppose any number of such vortices, however near one another, to be excited simultaneously; and the whole effective momentum in magnitude and direction will be the resultant of the momenta of the different component vortices each estimated separately. Hence we have the remarkable proposition that the effective momentum of any possible motion in an infinite incompressible fluid agrees in direction and magnitude with the magnetic moment of the corresponding electromagnet in Helmholtz’s theory. The author hopes to give the mathematical formulæ expressing and proving this statement in the more detailed paper, which he expects soon to be able to lay before the Royal Society. The question early occurs to any one either observing the phenomena of smoke-rings of investigating the theory,—What conditions determine the size of the ring in any case? Helmholtz’s investigation proves that the angular vortex velocity of the core varies directly as its length, or inversely as its sectional area. Hence the strength of the electric current in the electromagnet, corresponding to an infinitely thin vortex core, remains constant, however much its length may be altered in the course of the transformations which it experiences by the motion of the fluid. Hence it is obvious that the larger the diameter of the ring for the same volume and strength of vortex motions in an ordinary Helmholtz ring, the greater is the whole kinetic energy of the fluid, and the greater is the momentum; and we therefore see that the dimensions of a Helmholtz ring are determined when the volume and strength of the vortex motion are given, and, besides, either the kinetic energy or the momentum of the whole fluid motion due to it. 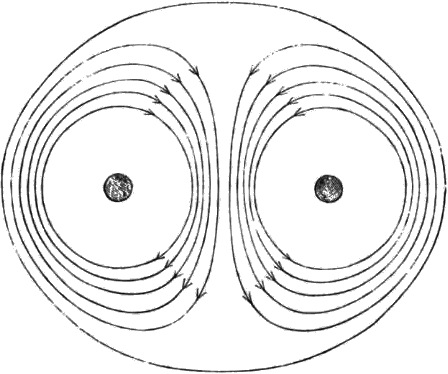 Hence if, after any number of collisions or influences, a Helmholtz ring escapes to a great distance from others and is then free, or nearly free, from vibrations, its diameter will have been increased or diminished according as it has taken energy from, or given energy to, the others. A full theory of the swelling of vortex atoms by elevation of temperature is to be worked out from this principle. Professor Tait’s plan of exhibiting smoke-rings is as follows:—A large rectangular box, open at one side, has a circular hole of 6 or 8 inches diameter cut in the opposite side. A common rough packing-box of 2 feet cube, or thereabout, will answer the purpose very well. The open side of the box is closed by a stout towel or piece of cloth, or by a sheet of india-rubber stretched across it. A blow on this flexible side causes a circular vortex ring to shoot out from the hole on the other side. The vortex rings thus generated are visible if the box is filled with smoke. One of the most convenient ways of doing this is to use two retorts with their necks thrust into holes made for the purpose in one of the sides of the box. A small quantity of muriatic acid is put into one of these retorts, and of strong liquid ammonia into the other. By a spirit-lamp applied from time to time to one or the other of these retorts, a thick cloud of sal-ammoniac is readily maintained in the inside of the box. A curious and interesting experiment may be made with two boxes thus arranged, and placed either side by side close to one another or facing one another so as to project smoke-rings meeting from opposite directions—or in various relative positions, so as to give smoke-rings proceeding in paths inclined to one another at any angle, and passing one another at various distances. An interesting variation of the experiment may be made by using clear air without smoke in one of the boxes. The invisible vortex rings projected from it render their existence startingly sensible when they come near any of the smoke-rings proceeding from the other box. April 26, 1867.—The author has seen reason for believing that the sodium characteristic might be realised by a certain configuration of a single line of vortex core, to be described in the mathematical paper which he intends to communicate to the Society. See, however, note added to Professor Tait's translation of Helmholtz's paper ( Phil. Mag. 1867, vol. xxxiii, Suppl. ), where the result [see infra, p.67] of a mathematical investigation which the author of the present communication has recently succeeded in executing is given. y²/a = 2x/a * (N+1)/(N-1) - (1+(x²/a²)), where logeN = (x+b)/a. The proof will be given in the mathematical paper which the author intends to communicate in a short time to the Royal Society of Edinburgh. That is to say, a circular conductor with a current of electricity maintained circulating through it.